Kader Sevinç, CHP’s Representative to the EU criticized the AKP for not doing enough to open the three EU accession-negotiation chapters – those on competition, social policy and public procurement – that carry no political baggage. “The government remains unwilling to open the social policy and competition chapters because there is a need for reforms on state aid, the unregistered economy, gender equality at work and child labor,” said Sevinç. Turkey has thus far opened 13 chapters in its negotiations with the European bloc. The talks have slowed down since 2005 due to Ankara’s refusal to open its ports to shipping from Greek Cyprus as well as stiff opposition from some member states, including France. Sevinç said the CHP was closely following Turkey’s accession process and had established a “shadow CHP team monitoring EU negotiations.” The team, led by Sevinç, is following each and every negotiating chapter in the Turkish-EU talks and briefing Kılıçdaroğlu about the progress made. 01-09-1959, Turkey applies for associate membership in the European Economic Community (EEC). 01-09-1963, Association agreement (“Ankara Agreement”) is signed by Ismet Inönü. 01-01-1995 Turkey-EU Association Council finalises agreement creating a customs union. 01-12-1997, Luxembourg Council summit declares Turkey eligible to become EU member. 01-03-2001, Council adopts Accession Partnership for Turkey. 28-05-1999 / 18-11.2002, Ecevit’s government undertook three major EU reform packages aimed at stabilizing the Turkish economy in preparation for accession negotiations with the European Union. 03-08-2002, The death penalty is being lifted by Ecevit government in Turkey. 01-05-2003, Council adopts revised Accession Partnership for Turkey. 24-04-2004, The separate simultaneous referenda held in Cyprus resulted in the majority Greek Cypriot population voting down the UN Plan, peace, unity and Europe, (75.38% against), whereas the minority Turkish Cypriot population voted for the Plan (64.91% in favour). 01.05 2004, Cyprus joined the European Union together with nine other countries. 01-12-2004, Council defines conditions for opening accession negotiations. 01-10-2005, Council adopts negotiating framework, and negotiations are formally opened. 03-10-2005, Luxembourg Summit, Turkey and Croatia officially started membership negotiations with the EU. 01-10-2005, “Screening process” begins to determine to what degree Turkey meets the membership criteria and what remains to be done. 01-06-2006, Negotiations are opened and closed on Chapter 25 (science and research). 01-12-2006, Because Turkey does not apply to Cyprus the Additional Protocol to the Ankara Agreement, Council decides that eight chapters will not be opened, no chapter will be provisionally closed. 01.01.2008, Cyprus joined the Eurozone. 01-02-2008, Council adopts revised Accession Partnership for Turkey. 30-06-2010, Negotiations are opened on Chapter 12 (food safety, veterinary and phytosanitary policy). 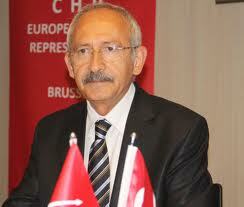 17-05-2012, Positive Agenda intended to bring fresh dynamics into the EU-Turkey relations was launched. 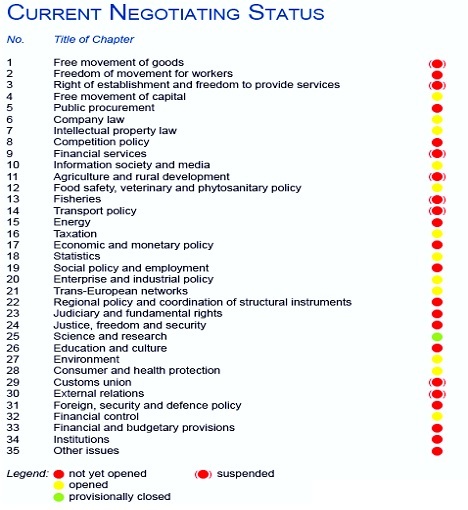 3-10-2005 / 30-06-2016 : In the accession process, 16 chapters (“4-Free Movement of Capital”, “6-Company Law”, “7-Intellectual Property Law”, “10-Information Society and Media”, “12-Food Safety, Veterinary and Phytosanitary Policy”, “16-Taxation”, 17-“Economic and Monetary Policy”, “18-Statistics”, “20-Enterprise and Industrial Policy”, “21-Trans-European Networks”,“22-Regional Policy and Coordination of Structural Instruments”, “25-Science and Research”, “27-Environment”, “28-Consumer and Health Protection”, “32-Financial Control”,“33-Financial and Budgetary Provisions”) have been opened to negotiations so far and 1 of them (“25-Science and Research”) has been provisionally closed.